Namely, the Renyi entropy production is monotonically decreasing function of time irrespective of the initial conditions. In the steady state it is equal to the lowest eigenvalue of the Dirichlet Laplacian. More details can be found in our paper. 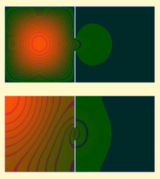 Shown is the time evolution of the probability distribution function for two different container geometries. The green-orange colormap is used to visualize the value of . 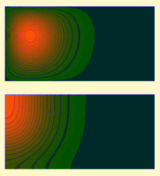 In the top pannel of each movie the Fleming-Viot process is presented, while in the bottom one, regular diffusion evolving from the same initial configuration is shown. The last movie concerns one possible generalization of the process described above, in which many types (colors) of the Brownian particles are allowed. When particles of different colors collide, both annihilate instantiously. 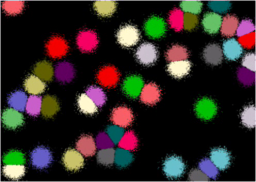 At the same time, randomly chosen particles of the corresponding colors are branched. This way the total number of the particles of each color is preserved.